For the fiftieth anniversary of the film, W.K. Stratton’s definitive history of the making of The Wild Bunch, named one of the greatest Westerns of all time by the American Film Institute. Sam Peckinpah’s film The Wild Bunch is the story of a gang of outlaws who are one big steal from retirement. When their attempted train robbery goes awry, the gang flees to Mexico and falls in with a brutal general of the Mexican Revolution, who offers them the job of a lifetime. Conceived by a stuntman, directed by a blacklisted director, and shot in the sand and heat of the Mexican desert, the movie seemed doomed. Instead, it became an instant classic with a dark, violent take on the Western movie tradition. In The Wild Bunch, W.K. Stratton tells the fascinating history of the making of the movie and documents for the first time the extraordinary contribution of Mexican and Mexican-American actors and crew members to the movie’s success. Shaped by infamous director Sam Peckinpah, and starring such visionary actors as William Holden, Ernest Borgnine, Edmond O’Brien, and Robert Ryan, the movie was also the product of an industry and a nation in transition. By 1968, when the movie was filmed, the studio system that had perpetuated the myth of the valiant cowboy in movies like The Searchers had collapsed, and America was riled by Vietnam, race riots, and assassinations. The Wild Bunch spoke to America in its moment, when war and senseless violence seemed to define both domestic and international life. 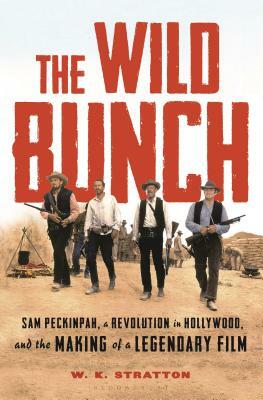 The Wild Bunch is an authoritative history of the making of a movie and the era behind it. W.K. Stratton is the author of five books of nonfiction and three of poetry. He has written for Sports Illustrated, Outside, GQ, and Texas Monthly, and was named a fellow of the Texas Institute of Letters in 2017. He is a longtime resident of Austin, Texas.